Are you looking for ruggedized, portable, and simple way to move large datasets into Azure? Well now you got Azure data box. You can move petabytes of data into Azure using Data Box. People now a days want lower capacity, even easier-to-use option. They cited examples such as moving data from Remote/Office Branch Offices (ROBOs), which have smaller data sets and minimal on-site tech support. This can be used for recurring, incremental transfers for ongoing backups and archives. And it should consist the same traits as Data Box – namely fast, simple, and secure. Microsoft has introduced Data box disk as their new member for such scenarios. Data Box Disk contains the same infrastructure and management experience as Azure Data Box. 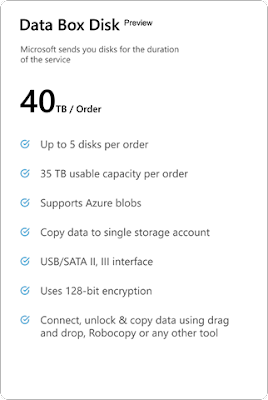 You can receive up to five 8TB disks, totaling 40TB per order. Data Box Disk is fast, utilizing SSD technology, and is shipped overnight, so you can complete a data transfer job in as little as one week. · The disks can be connected via USB or SATA. 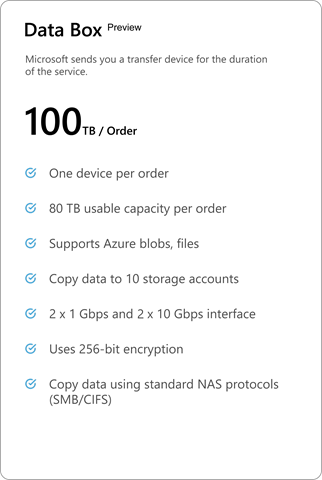 · Since Data Box Disk uses AES 128-bit encryption, once returned to the Azure DC, your data is securely uploaded, and the disks are cryptographically erased. · Data is safe at every point in the process.